Welcome to the Holiday Tablescape Blog Hop. I am so happy that you stopped by and feel so honored to be featured with such a wonderful and talented group of ladies. We owe an enormous amount of gratitude to the talented Chloe at Celebrate and Decorate for hosting this creative round up of Holiday tables. The schedule and links to the participating blogs are listed at the end of this post. I love Christmastime! God truly blessed me with the most wonderful family. I have the best husband a girl could ever wish for and three beautiful children. My Parents are the most caring people that you will ever meet, and my Grandparents were such a strong presence in my life. They always showed me unconditional love. I saw my Grandparents almost every day, and I know I was fortunate to have this privilege. It is not a gift that I have taken lightly. Only one of my Grandparents is living, and I treasure her very dearly. I miss my other Grandparents very much, especially at Christmastime. Along with my Parents, they helped to instill the true meaning of Christmas into my heart. I have such happy memories and treasure them so. Today’s Christmas table is a family inspired table of love, warmth, reflections of blessings, and happiness. For the underpinning of the table, I chose a cream lace tablecloth. Each place setting is anchored with a burlap placemat. For the centerpiece, a pretty Christmas pitcher is filled with greens, berries, and pine cones. The pitcher is flanked by crystal candlestick holders and red candles. Also adorning the centerpiece are American Fostoria glasses filled with pine branches and candy canes. The Fostoria glasses belonged to my Great Grandmother. Blue Christmas ornaments and candy Christmas trees are also scattered about the table. The place setting consist of red plates with white polka dots. The accent plate is from the Pioneer Woman Christmas Collection. The crystal is American Fostoria, and the flatware is Michelangelo by Oneida. I love these pretty plates form the Pioneer Woman Collection. They match the pitcher I used as the centerpiece. They have an old fashioned Christmas look. Thank you so much for stopping by today. Please be sure and check out the other bloggers participating in the Holiday Tablescape Blog Hop. I know that you will be in for a treat! There is lots of wonderful Holiday Inspiration. I hope that you have a wonderful Wednesday and a very Merry and Happy Christmas Season!!! Shannon, what a beautiful table full of love and memories. The polka dot plates and the Pioneer Woman salad plates make a perfect pairing. I loved reading about your family and what blessings and influences they have been on your life. I have so enjoyed this blog hop with so many talented ladies. Your table starts my day off with a smile! Wishing you a joy-filled day! Thank you, Pam, for your very sweet and kind words. It has been so much fun participating in the blog hop, and I am so excited for next week. I can’t wait to see everyone’s beautiful Christmas Decor! I hope that you have a great weekend!!! Mary, thank you for your very sweet and kind comment! I feel so honored to be participating alongside you and the other wonderful ladies in this fun Holiday Tablescape Blog Hop. Your tablescapes are always gorgeous, and I look forward to your posts. I hope that you have a great rest of your week!!! What a pretty table Shannon….I am loving those plates from the Pioneer Woman collection! You have so beautifully set the table around that wonderful dinnerware!…..A perfect centerpiece to set the theme…and you know how much I love the Fostoria stemware! Thank you, Shirley for your sweet words! I hope that you are having a great week, and I hope that you have a wonderful weekend!!! What a happy table, Shannon! Your thoughts on your family warm my heart. Love is what Christmas is about. I love your Pioneer Woman plates and pitcher. It is delightful and how you added greenery and berries to the pitcher and accenting with candy canes was perfect. I bet your children are asking if they can have a candy cane but I’m sure you have extra. Darling candy cane trees that pulled out the blue in your plates and ornaments were a great find. The justaposition of burlap placemats and a lace tablecloth works beautifully. I love your table. Yes, Bonnie, I have lots of extra candy canes, and they are going fast! My youngest loves them! Thank you so much for your very sweet and kind words. I’m so happy that I was able to join such a wonderful group of ladies in this Holiday Tablescape Blog Hop. It has been so much fun, and everyone’s table has been absolutely beautiful! I hope that you have a great rest of your week!!! Shannon, your Christmas is a fun mix of classic and modern styles. The lace cloth and Fostoria, together with the polka dot plates as chargers and burlap placemats, are a nice weaving of old and new, certain to delight all the generations that will share around the table, making new memories. The Pioneer Woman plates are super nice – you just can’t beat traditional red and green at Christmastime. Happy Holidays! Happy Holiday’s to you too, Rita! Thank you for the sweet comment! I hope that you are having a great week!!! Your table reflects your warm heart full of family love Shannon, it’s welcoming and actually feels like a hug! Love the PW plates and pitcher! It is so clever how you brought in your beloved blue 🙂 I wish you and your family a December full of fun, memories and blessings! Jenna, what a kind and sweet thing to say. That is what I hoped to convey, and I am so happy that you noticed that! I have had so much fun participating in the blog hop, and have loved seeing everyone’s beautiful tables! I hope that you have a wonderful weekend!!! I so enjoyed this pretty holiday tablescape. Your Christmas plates are fabulous and I adore the greenery and red berries. You always decorate with traditonal class and inspire! Thank you so much, Jemma! I hope that you are having a great week!!! Shannon, as always, what a pretty setting you’ve created. Love the plates and the pitcher and all the natural greenery. It’s so perfectly Christmas. I always love sharing with you on a blog hop! Thank you, Carol, for the sweet comment! It has been so much fun sharing with all of you wonderful girls on this blog hop. Everyone’s table has been absolutely beautiful! I hope that you have a great rest of your week!!! Such a pretty tablescape, Shannon! I love the Pioneer Woman line of dishes, too. I hadn’t seen these, they are so pretty with their delicate tree and incorporating the pitcher to carry through your theme. What wonderful memories you have. I mostly lived across the country from my grandparents and I am a little sad that my beloved granddaughters are currently across the country from me. I am blessed to have my parents now living out their senior years in an apartment above my garage. I joke that they live “in my backyard”. Thank you for being a part of the Holiday Tablescape Blog Hop! 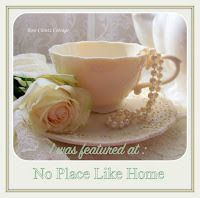 Sweet Chloe, thank you so much for hosting this wonderful blog hop and allowing me to be a part of it! I am so excited about the home tours next week, and can’t wait to see everyone’s beautiful Christmas decor. I hope that you are having a wonderful week!!! Rhonda, I am so happy that my tablescape made you think of your dear Grandparents. Thank you so much for your very sweet and kind words! I hope that you are having a wonderful week!!! Shannon, your table is so pretty and full of merry. Love the Pioneer woman’s Xmas plates. The candy canes, the greenery is lovely with your dishware. How special to have your Great Grandmother’s glasses. What a blessing to see your grandparents everyday as a child. You have those amazing memories to carry on with you. It has been a pleasure to blog hop with you. Merry christmas. Thank you, Linda, for the sweet comment. I am so happy that I was able to participate in this blog hop with such a wonderful group of ladies! You are all so talented! It has been so much fun!!! It’s NOT just because you mentioned it, but rather the overall look of this tablescape, indeed, does give off vibes of happy family times and memories. I love the colour scheme, the terrific contrast between the lace and the burlap, the unexpected but pleasing pop of blue and the pretty elements you combined to create the centerpiece. Anyone would feel welcome sitting down to a Christmas meal at this lovely table. Lori, thank you so much. That is exactly what I hoped to convey in my tablescape. I am so happy that you were able to see that. I have had so much fun participating in this blog hop. Everyone’s tables have been absolutely beautiful! I hope that you are having a wonderful week!!! Thank you, Sheila! It has been so much fun participating in the blog hop with you! I hope that you are having a wonderful week!!! Shannon, what a pretty table, I’m in love with your centerpiece and all of those gorgeous greens and berries! That pitcher is perfect! I love the memories you shared as well and it’s so nice that you bring that nostalgia to your table! Thank you, Tamara, for the sweet and kind comment! I’m so happy that you stopped by, and I hope that you are having a great week!!! Your table is so festive and lovely! I especially love your holiday theme plates. So much fun being on the hop with so many talented bloggers! Kristy, I agree. It has been so much fun being on the blog hop with this great group of ladies. You are all so talented. Thank you for the sweet comment!!! I hope you are having a wonderful week. I am so happy to be joining you on this fun Holiday Table Blog Hop. What an incredible group. The talent is just amazing. Your table is so pretty and festive. I love the Pioneer woman’s Christmas plates. She has a really nice collection of homewares at Walmart. The candy canes, the greenery go perfectly with your dishware. How special to have your Great Grandmother’s glassware. There is nothing like family isn’t it. Thank you, Janet, for the sweet and kind comment. It has been so much fun being on the blog hop with all of you. You are all so talented. The tablescapes have all been so beautiful! I wish you and your family a very Merry Christmas, too!!! Beautiful table Shannon! I love the pop of blue and the burlap. Such a winning combo. You create such a wonderful and welcoming tablescape for the holidays. Thank you so much Christine! I hope that you are having a wonderful week!!! Shannon, your words and images captured the essence of Christmas. The polka dot dinner plates are so pretty peeking out from the festive, colorful Pioneer Woman dishes. Love your burlap placemats, the ornaments, and whimsical candy canes. A gorgeous tablescape! So happy to be playing with you again on the blog hop! Thank you, Michael Lee, for the very sweet and kind words. I am so honored to be joining such a wonderful and talented group of ladies for the blog hop. It has been so much fun, and everyone’s tables are beautiful! I hope that you have a wonderful weekend!!! This is so lovely Shannon– your words about your family and your table! The trees on the plates remind me of bottle brush trees!! And I love the blue and red accents together. We don’t have a dining room- barely a serviceable kitchen table most days so I will have to live vicariously through your table-scaping talents! ♥ Have a very Merry Christmas!! You are so sweet Heather! Thank you for the kind comment! I’m so happy that you stopped by, and I hope that you have a Merry Christmas, too!!! Shannon, your table looks amazing! Your dishes really are pretty and so very festive and how lovely to have your Great-grandmother’s glassware. It all looks very special. Happy December! Thank you, Sandi, and Happy December to you too!!! I hope that you have a wonderful weekend!!! Shannon, love the christmas vase full of evergreen as your centerpiece. So festive! The matching plates are too cute too. The candy canes though made me feel very merry! Thank you, Emily, for the kind words. I hope that you are having a great weekend!!! The plates and pitcher really caught my eye. They are beautiful additions to a table that is very pretty. I grew up not knowing any of my grandparents and it warms my heart to hear how much yours influenced your life. Thank you for sharing this beautiful table and Merry Christmas! Thank you, Sandra, for the sweet comment. I hope that you are having a great weekend!!! Shannon you created a beautiful table. It was wonderful reading about your family and the memories you have. The plates are amazing and all the items look beautiful together. Thanks for sharing. Thank you, Bon Bon, for the sweet and kind words. I am so happy that you stopped by, and I hope that you are having a great weekend!!! Beautiful table, Shannon. I am gazing so fondly at your glassware. I saw this pattern at my mother’s holiday tables all my life. This last year, she had to go to an assisted living situation, so her precious things had to be parceled out. My sister-in-law asked for these glasses. There were so many sizes and many serving pieces. I just love how they compliment your polka dot plates. You did a lovely job. Linda, I have several different sizes of the Fostoria glassware. Both my mother and I also have some of the serving pieces. They belonged to my Great Grandmother. I am told that she loved crystal and collected this pattern. They are something that we treasure very much. Thank you so much for your very sweet comment. I am so happy that you stopped by, and I hope that you are having a wonderful weekend!!! Thank you, Snap! I hope that you are having a wonderful week!!! Its so great to hear about your family and how much love was there! Your table is beautiful! Thank you, Sara for the sweet words! I hope that you are having a wonderful week!!! So pretty! Thanks for sharing at Home Sweet Home! Thank you, Sherry! I hope that you have a wonderful weekend!!! So happy that you shared this with us this week, it’s so classic and beautiful. Thank you for sharing with us this week at Celebrate Your Story, have a great weekend. Thank you, Sandra! I hope that you have a great weekend too!!! Another beautiful table setting for the season… What a treasure to have Fostoria glasses from your great-grandmother. Thank you so much, Judith! I’m so happy that you stopped by! I hope that you have a wonderful weekend! Merry Christmas!!! Thank you, Vel! I’m so happy that you stopped by!! !